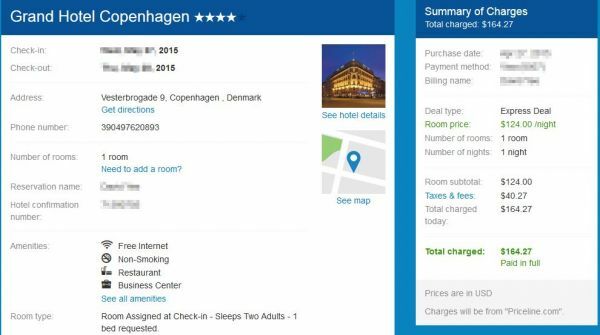 After booking the Fort Lauderdale hotel, I tried my luck again for the city of Copenhagen, Denmark, again at Priceline.com. 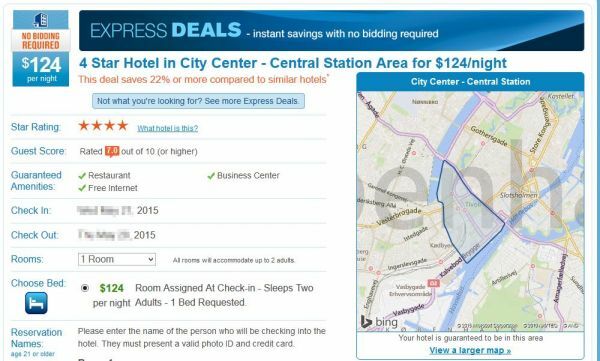 It seemed to be that the same hotel I was targeting in City Center of Copenhagen was once again cheaper with Express Deals vs Hotwire's mystery. The guest score, however, was 7/10, less than that of the Cambria. But for $124 at a great location, and 4 stars- I gave it a shot. After booking, the property was revealed to be.... The Grand Hotel Copenhagen. Doing a quick search I was disappointed to see that it got very mediocre reviews, with most complaining about it being outdated. It makes me wonder about the validity/accuracy of advertisement that this was a 4 star hotel. Oh well- still it is in a nice, very convenient location near the Tivoli garden. Tax was $40.27, so the total came out to be $164.27. Not too bad I suppose, but if you are looking for something nicer in the City of Towers, you might want to avoid selecting this as your mystery choice. I was really hoping that, because of the "Business Center" attribute, it would turned out to be the cool Tivoli Hotel, but no such luck.